This morning the crew over at FanlessTech has picked up on the release of a new Intel processor list from Fujitsu. In it, Fujitsu has published what appears to be the complete list of all of Intel’s planned 9th Gen "Coffee Lake-Refresh" Core processors. The catalogue includes some unannounced-yet-highly-anticipated 35 W TDP CPUs with up to 8 cores, new processors without integrated graphics, as well as upcoming Xeon E-2200-series products. Intel has been rolling out its Coffee Lake-Refresh products relatively slowly so far. 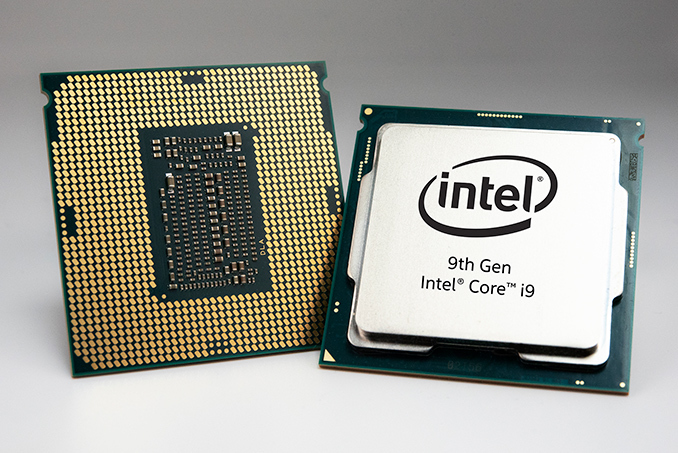 To date, the company has introduced nine 9th Gen Cores CPUs for desktops that use the architecture, with these chips aimed primarily at higher-performance PCs used by enthusiasts. As it appears from Fujitsu's document, the whole series will be considerably broader and will include CPUs designed for entry-level workstations, mainstream desktops, small form-factor desktops, and entry-level PCs. According to the list, Intel is altogether prepping 32 more processors that belong to the CFL-R family. As a result, the complete Coffee Lake-Refresh series for desktops would include 41 CPUs in total. Among notable entries in the list, Intel is readying 35 W and 65 W TDP eight-core processors. The company is also planning to release quad and six-core processors at the same TDPs. And not to be left out, there are also dual-core Celeron and Pentium Gold CPUs for mainstream and SFF desktops that are apparently inbound as well. Interestingly, the Fujitsu's list also confirms that some of Intel’s processors for entry-level PCs will not have an integrated GPU, which is an unusual choice given that entry-level systems rarely ship with a discrete GPU. Finally, the list also confirms that Intel is preparing its Xeon E-2200-series CPUs with four, six, and eight cores. These parts would be used to address the entry-level workstation market, offering processors that support ECC and other capabilities expected from this class of machines, And, like some of Intel's other segments, some of these new Xeons will apparently not have integrated GPUs either. i3-9300 ? ? ? ? i3-9100 ? 4.2 GHz 6 MB ? ? G4930 2 / 2 3.2 GHz - ? NOTE 1: Fujitsu only disclosed model numbers and core count of select upcoming 9th Gen Core CPUs for desktops. Some of the details about the processors come from different sources (e.g., retailers). Given the fact that Intel's plans may change, there are no guarantees that the company proceeds with the launch of all processors listed by Fujitsu. Intel traditionally does not comment on unreleased products. So while we have high confidence in the list given that it comes directly from a close Intel partner, don't expect to see Intel comment on it one way or another. they dont do it for no apparent reason. they sell all of these configs. just because a chip isnt for you doesnt mean somebody else doesnt want it. the only reason these chips exist is because someobdy asked for it. somebody thats going to roll out 1000's and is willing to pay a couple extra bucks to get the stock clocks and tdp for the chip set autmomatically instead of trying to buy a consumer part or a xeon and then set bios rules individually for each of them to come up with what is essentially these parts. its the same silicon as the 9900k (or the 9600k for that matter as well as other chips). when it get packaged the laser scriber puts a "T" at the end instead of a k and the machine that programs\fuses off features makes it a T instead of a K and 3 or 4 lines of bios code are changed to make them run at the correct tdp\turbo. its not hurting anyone. you are just looking for something to complain about.